The Kotromanić dynasty ruled the Kingdom of Bosnia and was perhaps the most important family in the country's history. They were sovereigns of medieval Bosnia and the surrounding lands, from the 13th century as Bans until the crowning and introduction of the Bosnian crown in 1377 and then as kings until the Ottoman conquest in 1463. The following women married into the House of Kotromanić, but were not born into it. Notes: Stephen I had three sons (Stephen II, Vladislaus and Ninoslaus) and five male-line grandchildren (Tvrtko I, Dabiša, Elizabeth, Catherine and Mary). Tvrtko I was the son of Vladislaus and Elizabeth was the daughter of Stephen II. Dabiša was the son of either Vladislaus or Ninoslaus. 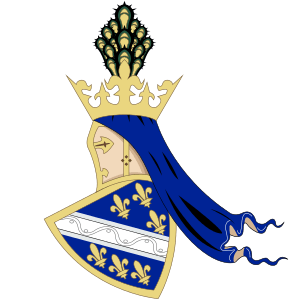 Catherine was the daughter of either Stephen II or Vladislaus. Mary could have been the daughter of any son of Stephen I. ↑ Malcolm, Noel (1 October 1996). Bosnia: A Short History. London: New York University Press. p. 364. ISBN 978-0814755617.